General Sheridan was selected by General Ulysses S. Grant to command the Union cavalry after significant successes as an infantry division commander in the Western Theatre of the Civil War. As the cavalry commander, he breeched the defenses of Richmond, laid waste to the Shenandoah Valley, and ultimately applied the tactical pressure that forced General Robert E. Lee’s surrender at Appomattox Court House in 1865. In later years, Sheridan fought in the Indian Wars of the Great Plains and was instrumental in the development and protection of Yellowstone National Park. 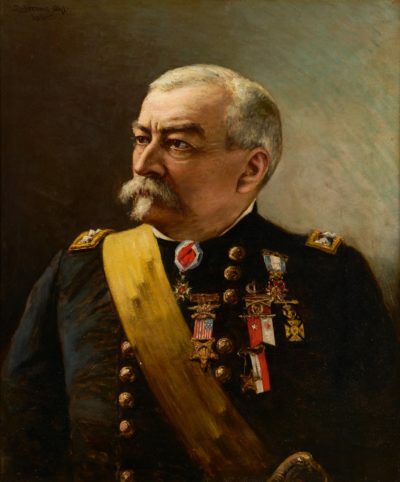 In 1883, he was appointed General-in-Chief of the U.S. Army. In 1888, just before his death, he was appointed to the rank of General by President Grover Cleveland.